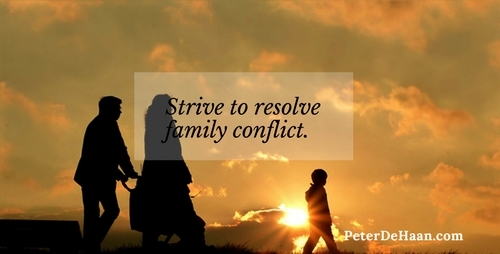 There are many ways to solve family problems, but kicking out your son isn’t one of them. Last week we looked at the story of Cain and Abel. We examined the first case of sibling rivalry. Things escalated out of control with one brother ending up dead and the other sentenced to wander, forever carrying the stigma of the world’s first murderer. As we march through the book of Genesis, many centuries pass. Now we consider father Abraham and his two sons Ishmael and Isaac. Born of different mothers, these two half-brothers don’t get along either. As a solution, Ishmael and his mom are sent away. Problem solved. Sort of. Separating the sparring brothers doesn’t resolve their differences, it merely uses distance to keep them from fighting. This isn’t a solution to fix a problem but merely a tactic to ignore it. This is one more instance when the Bible instructs us in parenting by showing us what not to do. Beyond this it’s also a case study that teaches us what to avoid when pursuing problem resolution. Isaac, however, gets to stay. He remains with his mom and his dad. Life is good for him. Abraham discards his first son to focus on his second son. Family 2.0. Though the Bible account focuses on Isaac, we do hear of Ishmael one more time. About seventy-five years later, Abraham dies. Ishmael returns. He and Isaac bury their father. Ishmael and Isaac both pay their respects. They both mourn their father’s passing. Does this mean Ishmael and Isaac reconciled? Possibly. I hope so. But I’m not sure. No one knows. But unlike Cain and Abel, one brother did not kill the other. Instead, they eventually figure out how to come together. This is something to think about. Though using distance to separate us from our problems may seem like the best solution, it’s merely a way out. Instead we must seek to restore damaged relationships. It may take time, a long time, but it’s worth the effort.